So, the Famicom turned 30 today. In honour of that, let's look at one of the coolest accessories ever made for the console, one that sadly never made it out of Japan. In 1984, Nintendo released the Famicom Data Recorder, a tape deck peripheral for the console. Yes, cassette tape. The Data Recorder was a pretty handy piece of hardware! It could be used to run homebrew games programmed by users, but even cooler, Nintendo opened up some of its own games for use with this editing capability, meaning players could create their own Excitebike tracks then save them to a tape (explaining why the original NES version of the game in the West had options to "save", even though you could do no such thing). 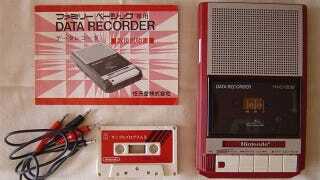 Perhaps the best thing about it, though, at least for Japanese kids of the 80s, was that it doubled as a regular tape deck, right down to the fact it had a built-in microphone (for recording) and its own external speaker. Sadly, the Data Recorder was expensive and didn't sell that well, the experiment replaced -and greatly improved upon - a year later with the release of the Famicom Disk System.